This is our third-generation cover for Birth Pool in a Box, incorporating all we have learned from thousands of uses. Women and midwives said they liked our Fitted Heat Cover but wanted a cover that does a good job with a price of $33. So we went back to fundamentals and concluded that: The great majority of heat lost from a birthing pool is from evaporation of water, not conduction or radiation. A basic securing mechanism is essential for safety being able to see through the cover while attached. The new ClearFit Cover for Birth Pool in a Box fits the bill: It is colourless, allowing objects and water level to be seen and estimated. It forms a seal over the pool and liner eliminating evaporation during filling and at other times the woman is not in the pool. 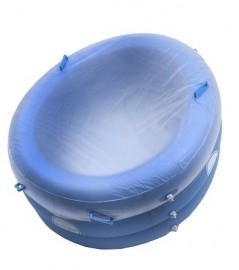 It fits snugly over the top chamber of the pool, with holes over the 4 outside handles that keep it in place.